On this page you can find the different articles, radio interviews and videos that talk about Students Supporting Israel activities or include quotes from our student leaders, in addition to articles written by SSI students. SSI UCLA's amazing work is covered in Fox News Nation and JNS.org! 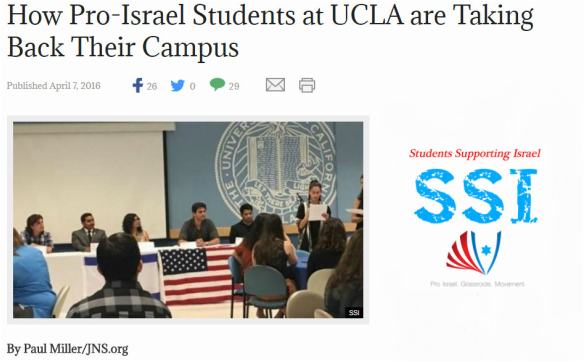 "How Pro-Israel Students at UCLA are Taking Back Their Campus"
"A look into the front lines of fighting, against the BDS Movement." Bellow are some of the videos featuring SSI speakers and interviews. More videos can be found at the SSI YouTube Channel. 12/15/15 - Reflections on One of my Proudest Moments of the Past 26 Years as Rabbi and Executive Director of Indiana University Hillel, by Sue Silberberg, Times of Israel. 12/15/15 - Repugnant Comparison of Trump to Hitler, by Sean Seigel, SSI Blog - Jerusalem Post. 11/30/15 - Stop Solving Problems “Behind the Scenes” – Let’s Make Some Noise!, by Ilan Sinelnikov, SSI Blog - Jerusalem Post. 11/15/15 - Students Supporting Israel Honors Memory of Victims as the Minnesota Student Association Rejects 9/11 Recognition, By Valeria Chazin, SSI Blog - Jerusalem Post. 08/28/15 - The Consulate General of Israel to the Midwest was proud to participate in and support Students Supporting Israel’s (SSI) first national student leadership conference. 05/28/15 - Students Supporting Israel forms at MU in response to Middle East conflict, by Chantelle Moghadam, The Missourian. 02/01/15 - Students Supporting Israel: Pro Israel Network Links 24 College Chapters Wake Up! The Jewish Press by the Jewish Federation of Greater Des Moines. 12/09/14 - Into the Shark Tank - By Barbara Bensoussan. Mishpacha Jewish Family Weekly. 12/09/14 - Anti-Semitism at the University of Minnesota? by Ezra Strohm. TC Jew Folk. 12/01/14 - Is excluding a student activist from a university job based on his political activity a crime in Minnesota? By Eugene Volokh. The Washington Post. 11/27/14 - Minnesota University student official compares group backing Israel with KKK. By Tzvi Ben Gedalyahu. The Jewish Press. 11/27/14 - Israeli Dismissed From U. Minn Post by BDSers Vows to Overturn Ruling - By Dave Bender. The Algemeiner. 11/26/14 - Student gov't rep compares pro-Israel group to KKK - By Ron Feingold. Campus Reform. 11/25/14 - UCLA Divestment Draws Mixed Responses at Georgetown - By Suzanne Monyak. The Hoya. 11/12/14 - Eventful week brings campus discussion of Israel and Palestine into focus - By John Thomas. The Minnesota Daily. 10/06/14 - Die-In protests fuel the fire - The Daily Aztec. 10/10/14 - Investigation Overturns Student Government Chartering Decision - By Riley Hunter & Staff Writer. The Echo (PDF File, Front page). 10/05/14 - Gaza conflict extends Divest debate at DePaul - By Brenden Moore & Matthew Paras. The DePaulia. 10/03/14 - Ezra-Levant Speaks on Campus - By Jake Scott. The Ryersonian. 10/03/14 - JCRC applauds Augsburg Colleges's decision to recognize SSI as a chartered student organization - By Jewish Community Relations Council. 10/02/14 - Pro-Israel Group Rejected by Augsburg College - By Casey Harper. The Washington Free Beacon. 09/30/14 - Augsburg College Rejects Campus Israel Group - By Bradley Machov - TC Jew Folk. 09/06/14 - Students Supporting Israel rejected by Student Government - By SSI Augsburg Board. The Echo (PDF File, Page 5.). 09/24/14 - University of Minnesota Professors Organize Anti-Semitic Event - By Ron Feingold. Truth Revolt. 09/05/14 - Pro-Israel group set to make debut - By Victoria White. The Battalion Online. 09/10/14 - Student groups ramping up advocacy in light of Israel-Palestinian conflict - By Peter Milonas. The Ryersonian. 09/09/14 - UGA students hold rally at the Arch in support of Israel - By Jonah Allen. The Red & Black. 07/03/14 - Aggie Hillel to recognize deaths of Israeli teenagers - By Allison Rubenak, The Battalion Online. 06/25/14 - Vigil Held for Israeli Teens - By Carmen Heredia Rodrigez. Indiana Daily Student. 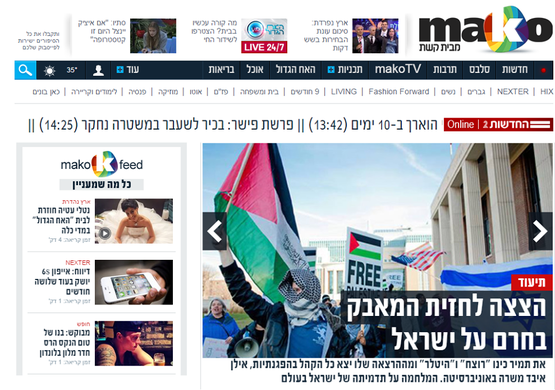 05/15/14 - Battle for Israel's future should be fought on US campuses - By Naor Bitton, Ynet News. 05/29/14 - Israel on Campus (Hebrew) - By Anat Taner, Ynet News. 05/05/14 - Consulate Training (Hebrew) - By Anat Taner, Ynet News. 04/16/14 - Being Part of the Story - By Itzik Yarkoni, Times of Israel. 04/10/14 - An Open Letter From an American Who Prevented Peace In The Middle East - By Ron Feingold, Times of Israel. 04/10/14 - Israel offers coexistence - By Shira Frishman, The Minnesota Daily. 03/11/14 - The Minneapolis model: Innovating Israel advocacy - By Barry Jakob, Times of Israel. March 11, 2014. 10/17/13 - Among the turmoil, Israel can be a model for stability - By Shira Frishman and Ilan Sinelnikov, The Minnesota Daily. 09/12/13 - Good deeds ‘spread light’ to 9/11 - By Alexandria Chhith, The Minnesota Daily. 12/04/12 - “Die-ins” embolden extremists at Gazan’s expense - By David Axelrod, The Minnesota Daily. 11/27/12 - Pro-Israel students rally on campus - By Alexi Gusso, The Minnesota Daily. 11/09/12 - Students clash over Middle East - By Brain Arola, The Minnesota Daily. 11/12/12 - Silencing speech - By David Axelrod, The Minnesota Daily. 10/04/15 - SSI Tailgate: Pro-Israel, Pro-Peace, and Pro-Fun! 09/08/15 - First SSI Conference, It's All About the Students! 05/15/14 - Cameron Erickson the President of SSI at DePaul University debates the President of SJP. - WBEZ's WorldView.